← Upcoming events, Airshows and Colleges #26-28. I just spent the last two days in the shop, working on a number of things from 8am until 10 p.m. The bulk of this time was assembling an engine for a builder who opted to have us reassemble his engine after he upgraded to a billet crank. The engine is a Gen. 1 Weseman bearing, 2700cc engine with all of our Gold Systems. We ran it on the test stand just before sundown. It was perfectly smooth. I wondered how many sunsets this engine would see from the vantage point of several thousand feet. With luck it will be more than a thousand. Spending the time wrenching on this gave me a lot of time to think, and many of the ideas came back to the simple statement: Why not the Panther engine? Above, Dan Weseman and I stand in our front yard last October. This was the first run of the Panther’s engine. Dan picked up all the parts for the engine, but I assembled it for him and ran it as a small contribution to the success of his project. It needed absolutely no maintenance nor adjustment, other than oil changes in this period. It is dry as a bone, and has not leaked a single drop of oil. On some other non-Corvair engines, running that hard would produce detectable stress. There would be overheating, required re-torque on heads, or valve adjustments. Conversely, a differential compression test on the Panther’s engine near the end of the test cycle revealed near perfect 79/80 compression: The operation had merely served as a good break in procedure on a Corvair. Other people promoting car engine conversions don’t run them like this. You may not be planning on this type of operation, but it is a very effective demonstration that the Corvair, as we promote it and teach people to build it, isn’t anywhere near the margins. The Panther engine is well built, and made of good stuff, but it isn’t “special” at all. It is made the exact same way we teach builders to make them at Colleges, it is made of standard off the shelf items that we and the Wesemans sell. Anyone willing to invest some time, follow directions and get their hands dirty can build a clone of it and get the exact same consistent performance that Dan has. Builders are doing just this; read this story from last year: World’s Strongest 3,000cc Corvair, built by Greg Crouchley as an example. Corvairs are not for everyone, but if you are going to build one, Why not a Panther engine? Why not a Panther engine? What do I mean by this? I am not speaking about everyone opting for a billet crank, nor am I speaking of having myself assemble your engine. What I am saying is that every builder should decide now what level of operation they are aiming for, and make sure they have a proven plan in place to get this. I can think of no rational reason why any builder would want less reliability that Dan had through all of his flights. Why not have an engine that has the same predictable, boring 40 hour test period? Almost all builders would agree that they want this type of service from their engine, yet many people get derailed from this. There are some obvious examples: in the last 10 years, there have been two KR-2’s destroyed on their first flight from power loss. Each of these builders elected to build ‘unique’ engines that many ‘features’ I had long told people not to do. The first person who flew a Corvair powered Dragonfly ended in a field with a motor that detonated until it stopped. Cause? He made his own ignition system because he though his would be better than ours. He determined this, yet he didn’t know that 32 degrees is a total advance not a static idle setting.How far will a Corvair fly with 55 degrees of advance? About 1/2 a mile. About 50 people witnessed that ‘flight’. I am sure that every one of them told friends that Corvairs were bad. Not a single one of them understood that the real mechanical problem was the nut holding the stick. On the other end of the scale, we have people whose engines don’t work as well as they should for small simple reasons. We have people with engines that leak oil from many locations simply because they refuse to use the sealers that my instructions say to. The most common thing these builders say is “you shouldn’t have to use sealers on gaskets.” While that is a wonderful perspective, it falls in the category of “you shouldn’t have to pay taxes” and “you shouldn’t have to get old.” As crazy as this sounds, I don’t think flying around with an oily engine as a protest against major gasket companies is a very effective form of protest. I still get photos of engine installations that have many ideas that I have long asked people not to do. Alternators on the back of engines driven by belts are a prime example, especially if that belt runs right beside the distributor. Want an alternator on the back? Use Dan’s direct drive set up. Want more than 20 amps for some reason? Run both front and rear ones. Sound crazy? It actually weighs less than a single 40 amp unit, and it doesn’t require a belt on the back. The number one reason why builders tell me they don’t want to use one of the proven systems is “I need more than 20 amps.” I try to kindly point out that they are yet to understand the concept of intermittent vs continuous loads. Yet rather than read and learn about this, many builders will spend months trying to figure out how to mount a giant alternator on their engine. Only much later will they find out they never needed it. Decisions people make about planes while armed with insufficient information to make such choices wastes a staggering about of time and money in homebuilding. This can always be avoided by just studying things that are out there flying without issue, learning more about why they work, and patterning your plan after these examples. The second biggest reason why people don’t end up with an engine that works like the Panther’s is the builder starts listening to a buddy, a local expert, or a guy on the net who gradually over time talks the builder into building his engine differently. 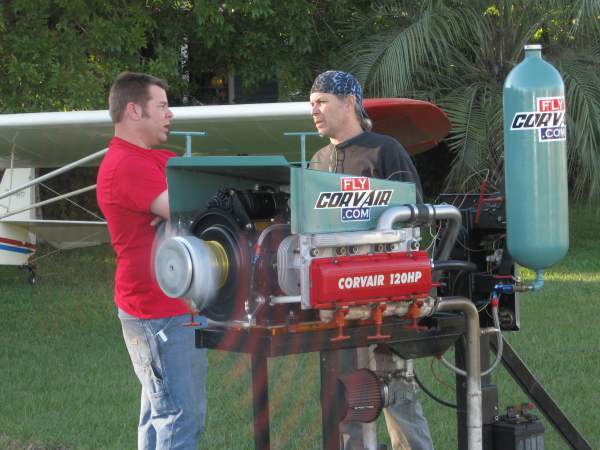 Without fail, none of the advisors can ever say, “I have this on my Corvair powered plane, and it works flawlessly. ” Instead their advice is always “we did this on race cars” or I know someone who did this on a Mooney” You would think that people would restrict their plans to following things that have proven to work on Corvair powered planes, but they don’t. Yes, I know how to build Corvair that give good reliable trouble-free service, but I also know almost all the ways that people have tried and failed to do this. We have been working with Corvairs long enough that new builders very rarely have an original bad idea these days. They are almost always a rerun that has been long proven to work poorly or not at all. It is a free world, and you can elect to replicate any previous bad experiment and see if physics, chemistry and gravity change their rules and give you a different result…. Or you can just as easily follow good examples that are long proven to work, and have Physics, Chemistry and gravity work as your loyal allies. Your life, your move, chose wisely, you are going to have to accept either result. Because of the way we run the Corvair movement, Building an outstanding engine is available to any builder who decides that it will be his path, and is willing to put in the effort to get it. It isn’t just for sale to the wealthy, it is available in steps to builders who really understand why Learn build and fly is all about. Builders who decide that they are not just going to be appliance owners, they are going to be skilled operators of solid machinery that they fully understand and are the master of. This is the real reward of being part of the Corvair movement. -ww. 3 Responses to Why Not the Panther engine? When is the next Corvair College and where will it be held?